The Best Merida Cenotes in Mexico to Explore in 2019! Merida is a gorgeous colonial city located in the northeastern tip of the Yucatan peninsula. The cenotes around Merida are famous for their beauty, isolation and cool, brilliant waters. Most of the thousands of Merida cenotes can be found along the Chicxulub Crater. It is believed that the giant asteroid that created this crater also caused most of the cenotes. We will talk more about that in the Merida history section. Probably the most famous cenotes near Merida are the Cuzama cenotes, which are discovered by horse and cart, and the Homun cenotes, which are known as being off-the-beaten-path and untouched. Founded on January 6, 1542, Merida is named after Merida in Extremadura, Spain. 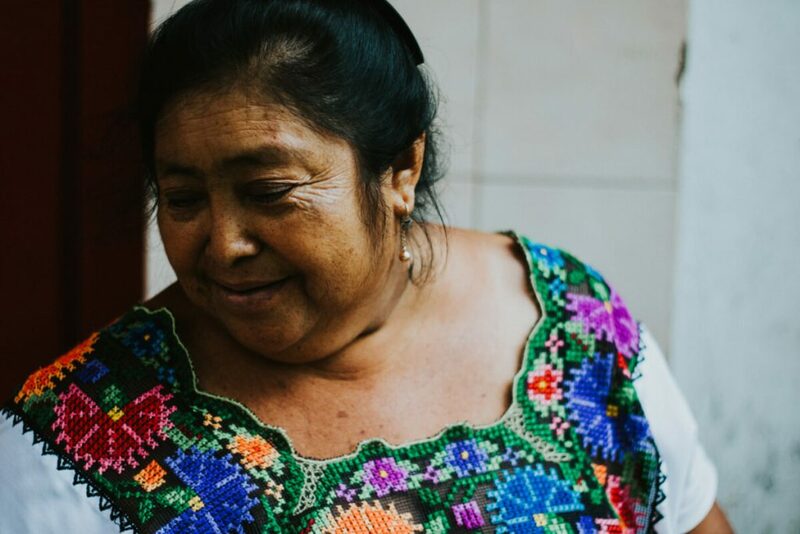 However, the city demonstrates influences from the indigenous Mayan population, as well as from the Spanish, French, British, and even Lebanese and Dutch. It was built on the earlier Maya city of Ichkanzihoo, the ‘City of Five Hills’. This city itself dates back centuries. As a result, many consider Merida to be the oldest continually occupied city in the Americas. The city of Merida is the capital of Yucatan state. 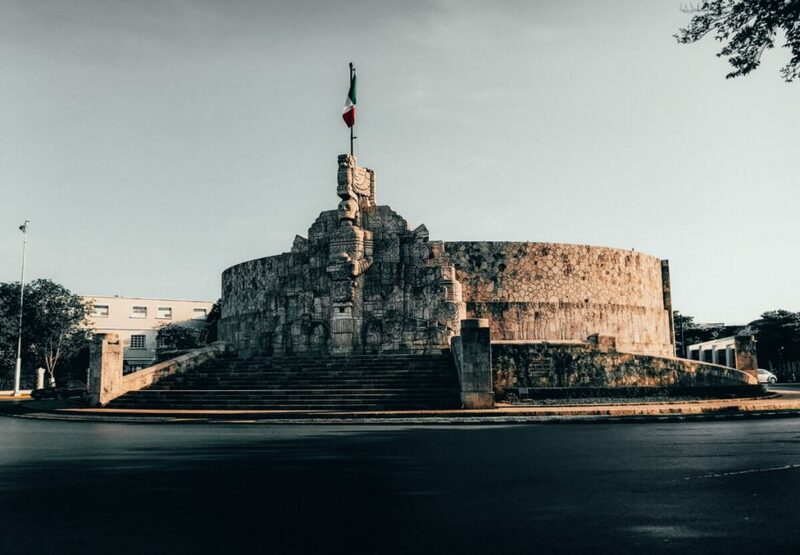 Located within the Yucatan peninsula, Merida is situated just a short distance (35 km) inland from the tropical waters of the Gulf of Mexico, about 300 km from Cancun. The city’s Centro Historico, one of the largest in the Americas, contains a variety of buildings dating back to Spanish colonization of the area. The city’s ancient protective walls have also survived. 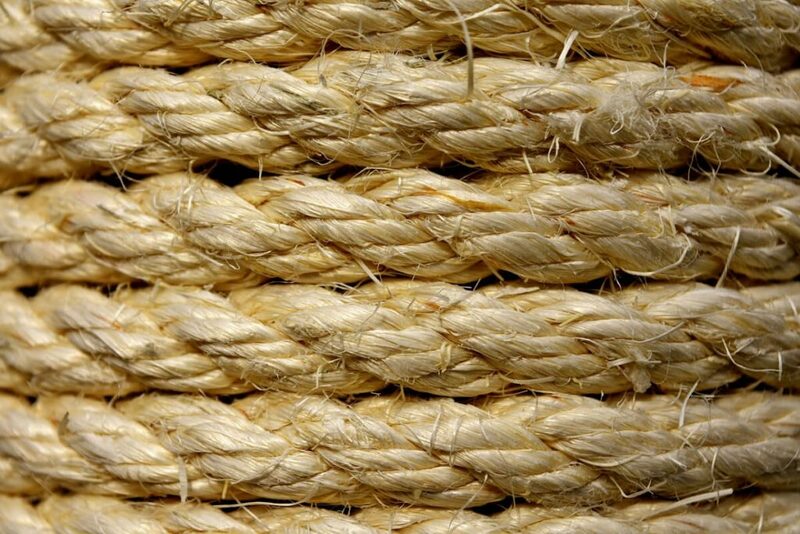 In the late 19th and early 20th Century, Merida regained some of its historic prosperity through the growth of henequen, a species of agave, used to produce a sisal-like fiber. If you take the horse ride to the Cuzama cenotes, you will travel along the tracks of an old farm that previously produced these valuable fibres. It is a fact that, for a short period of time, Merida housed more millionaires than any city in the world. Traditionally isolated from the rest of the country because of its location, Merida’s Mayan culture remained resilient for many years and a unique culture developed. Among its modern population of almost one million people, the city has the highest indigenous population, descendants of the Maya. It has had the honor of being the American Capital of Culture in both the years 2000 and 2017. Most Merida cenotes are located along the ring of the Chicxulub Crater. An impact zone of a huge asteroid, between 10 to 15 km in diameter, that struck the area roughly 60 million years ago. 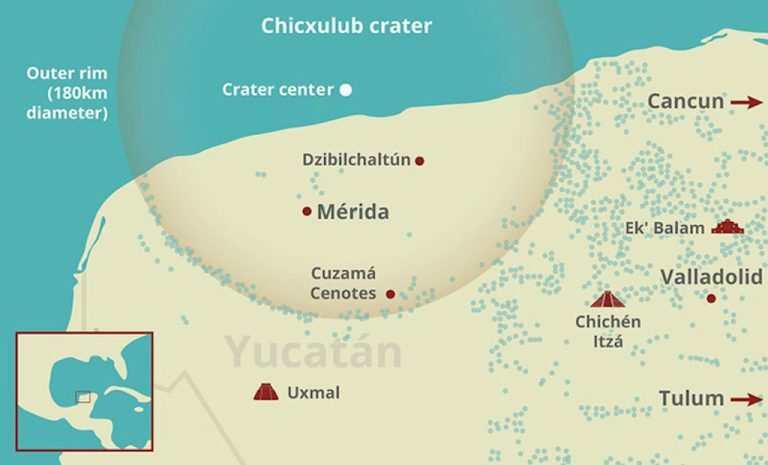 The strike of the asteroid that caused the massive Chicxulub crater is widely regarded to have been the strike that brought the rule of the dinosaurs to an untimely end. Roughly 150 km in diameter and 20 km deep, it was still only discovered in the 1970s. The crater edge marks an area abundant with sinkholes – known as the ring of cenotes. 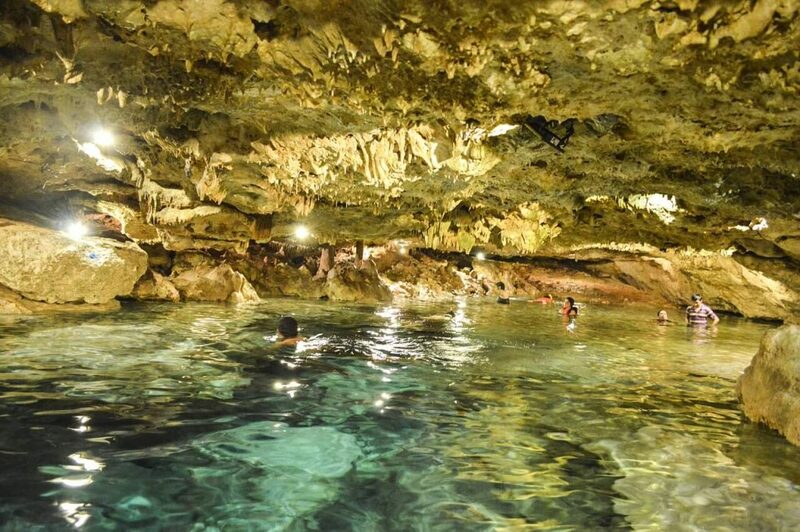 Of the 6,000 individual cenotes thought to exist in the Yucatan, more than 900 belong to the ring of cenotes. 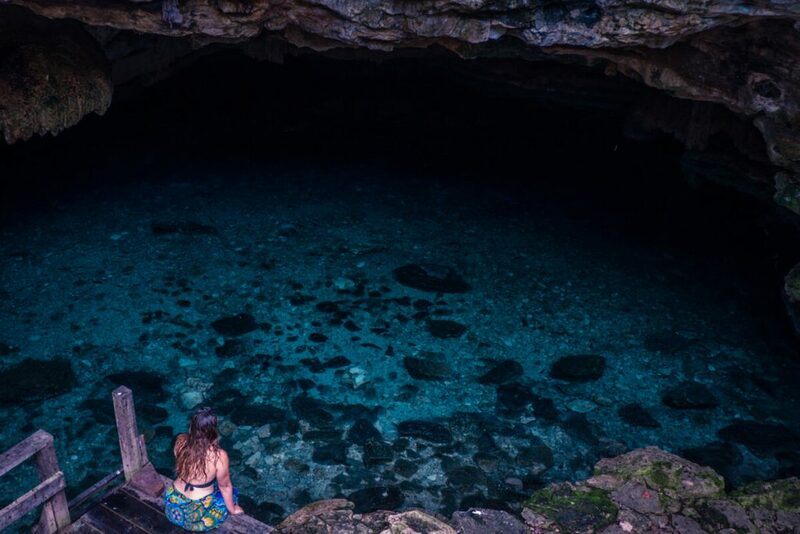 With so many possible cenotes Yucatan to choose between when visiting Merida and the Yucatan peninsula, which are considered the best cenotes near Merida? Check out our favorite cenotes below, including those cenotes at Cuzuma, and Homun cenotes too. There are three main cenotes in the jungle around Cuzama which are often visited together as part of a package tour. Each of the three cenotes is ultimately reached by a ‘truck’ pulled by a horse old tracks that lead through the local landscape. The series of horse-drawn carts run along the rails that were once used to transport the agave plants to the factories that processed and made the rope. To read more aout this fascinating history, check out the Merida history section above. Cenote Chacsinicche is a semi-open cenote and probably one of the better choices for swimming and jumping. 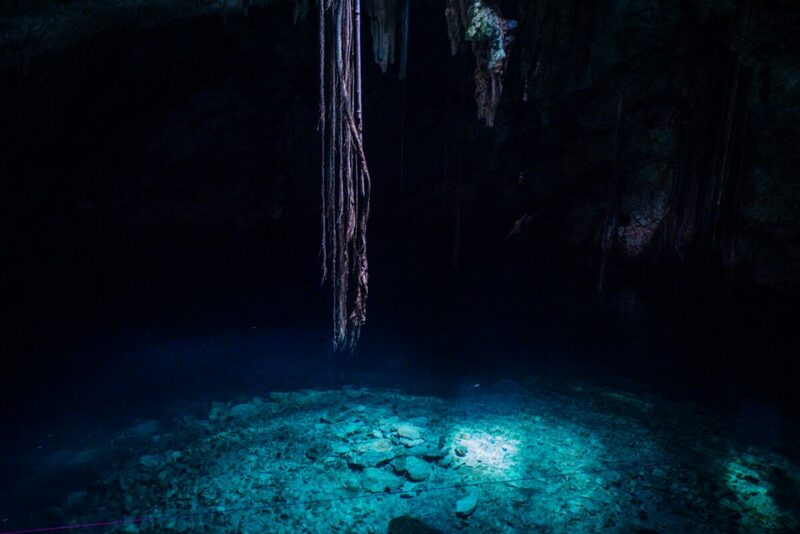 This cenote has more sunlight than the others which illuminates the crystal blue waters, allowing you to see the bottom. The cenote is accessed down a set of wooden stairs wedged into rock that opens up into the large cavern. Chacsinicche has a stunning series of tree roots dropping down from the ceiling. Its maximum depth is 27 meteres. 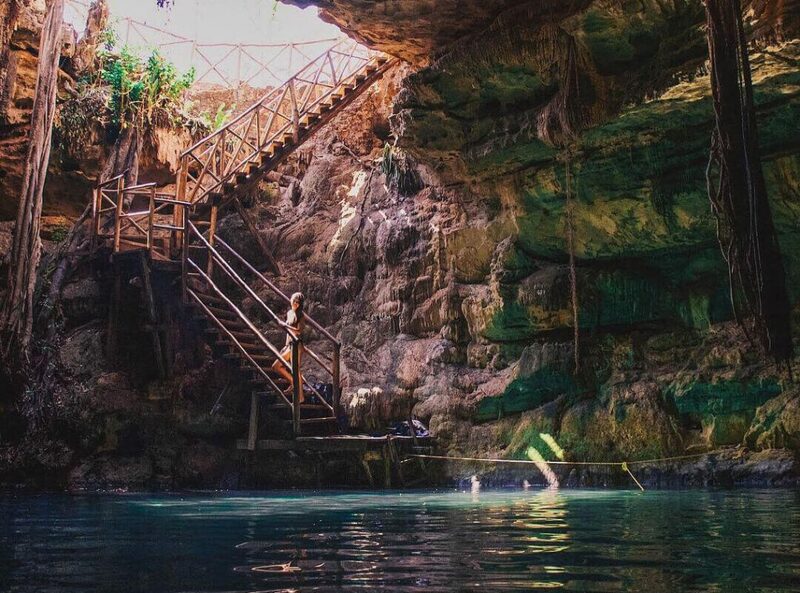 Cenote Bolonchoojol requires visitors to descend its 15 meters on a vertical ladder. Sunlight manages to penetrate its cave roof through small breaks in the rock where tree roots are trying to find the water’s surface. This minimal sunlight turns the water striking shades of turquoise and emerald. The name Ucil is actually the name of a species of cricket that is abundant in the area. Cenote Ucil is a cave accessed through a small passageway through the roots of a large tree. This feels a little bit like you are Alice in Wonderland. Ucil is lit up by artificial light so you are able to see the impressive underground geological formations. If you are feeling extra curious bring a water-resistant head torch so you can explore the cave. If you don’t have access to a vehicle, this information will help you get from Merida to the Cuzama cenotes. Buses from Merida’s Noreste terminal (on Calle 67 and 50) take about an hour and a half to get to Cuzama town center. There are several departures a day. Alternatively, use a colectivo shared taxi from the same terminal. 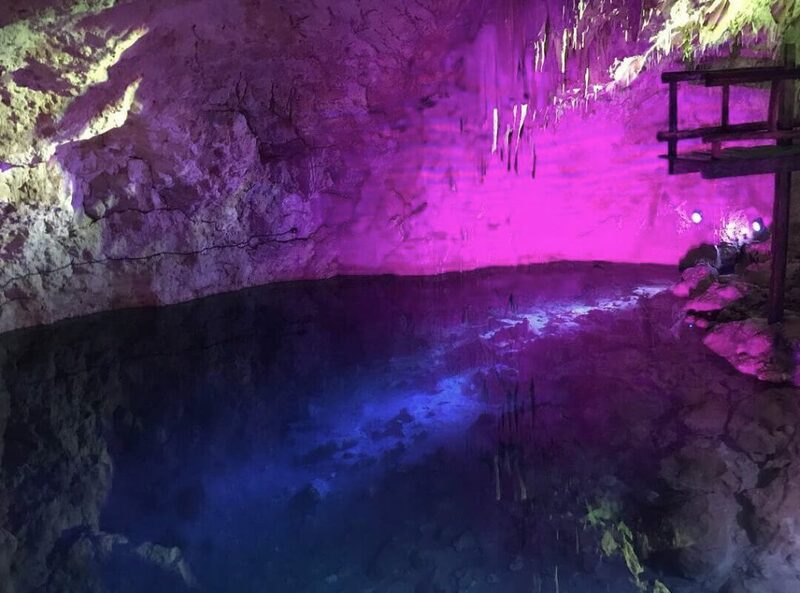 Day tours can also be organized in Merida at hotels and tour offices should you prefer to use this option to easily visit the Merida cenotes. The small village of Homun is located roughly 55 km southeast of Merida. 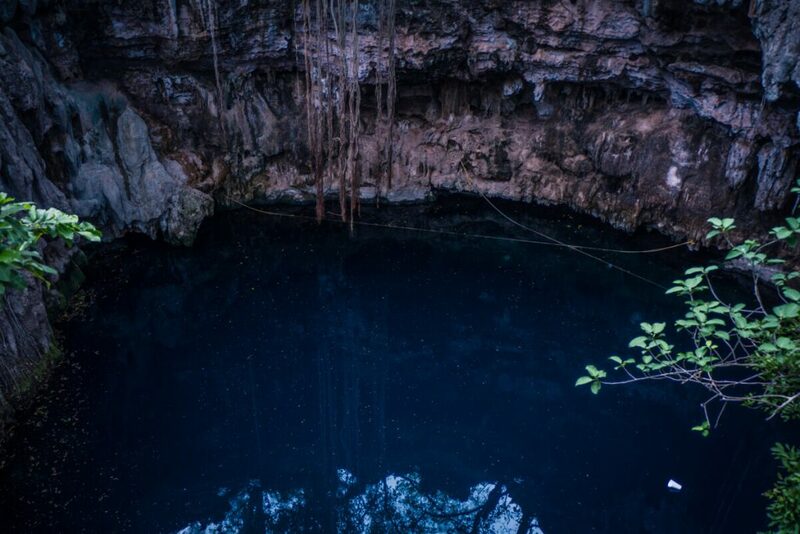 Homun is home to many cenotes as it is located on the Ring of Cenotes or otherwise known as the edge of the Chicxulub Crater. To find out more about the crater and how it may have caused Mexico’s cenotes, read out history in the section above. It may look unremarkable from the surface, but head below ground. You will discover why Cenote Yax Bacaltun is so highly regarded by those in the know. The huge cave here has breath-taking rock formations and a rope swing. You will find all the facilities you need. There are Mayan ceremonies are performed here as well as a restaurant which is open on the weekends. 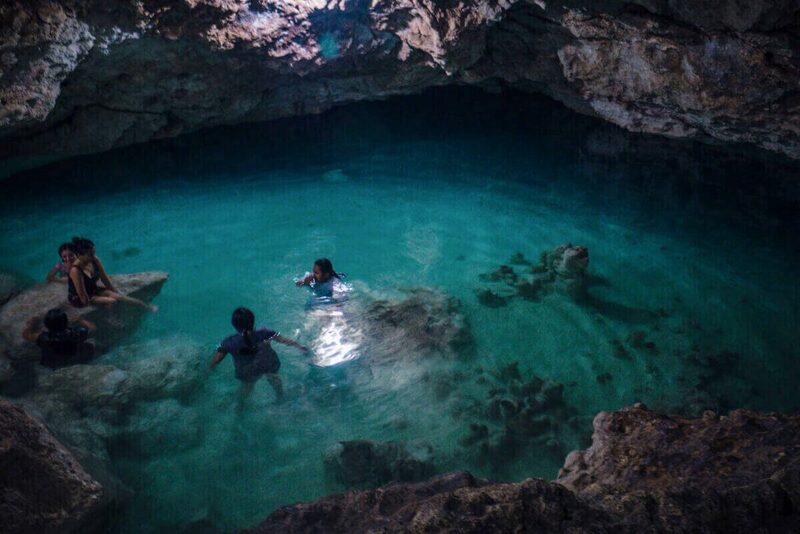 Santa Barbara is home to three cenotes, Cenote Chaksikin, Cenote Cascabel and Cenote Xoch. The well developed park is a little bit like Cuzama, where you can jump on a ‘truck’ pulled by a horse to visit all of the cenotes. The facilities here include : restaurant, lockers, lifejackets, showers, bathrooms, even a shop. Also, If you are interested in moving at your own pace between Cenotes there are bicycles available for hire. Cenote Canunchen is a relatively new cenote. It can be found on the Bal Mil Cenote Road heading out of town east on Calle 19. Canunchen is a cave cenote accessed by a small opening in the cavern ceiling. Follow the steep stairs down to water level where there is a wooden platform for you to keep your things dry while you jump in the cool refreshing waters. Cenote Pool Uinic is one of the more recent operations, opening in 2016. 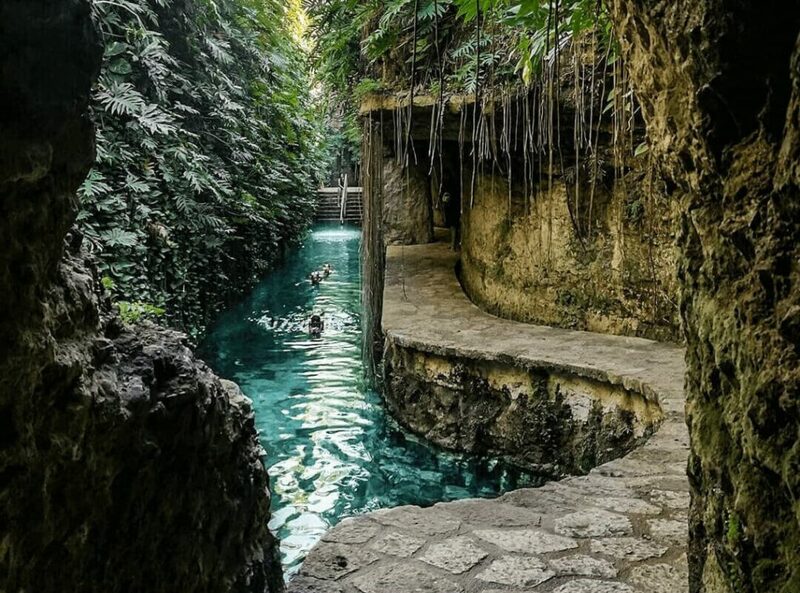 As you park at the herbal shop, a guide will show you the path to the cenote entrance. As you decend the stairs into the underground you will pass a earthy oasis with poplar tree, which you will see alot around the cenotes. 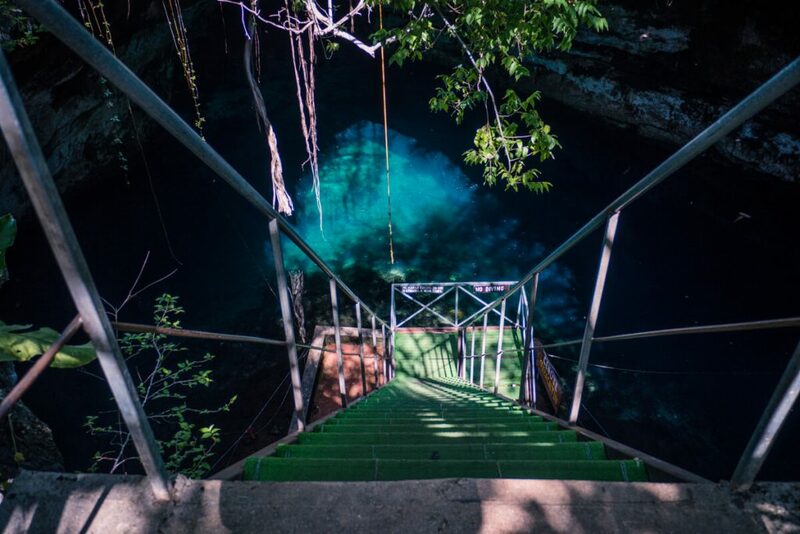 Further down you will reach the small but refreshing crystal clear waters of this cenote. Almost fully covered with a rock ceiling, Cenote Santa Rosa is pierced with just a few shafts of sunlight. The cenote is lit up with artificial lighting, bringing it to life. You can find a restaurant, changing rooms, toilets, and showers. Even rent a Cabana here to stay the night. Homun is close to Cuzama, and both places can easily be visited in the same trip. Follow the directions above to get to Homun. Oncd you arrive, there lots of cenotes in Homun that you can visit, but the roads are hidden and you will need access to a vehicle. It is likely that touts will intercept you in the town of Homun and offer to take you on a cenote tour. Otherwise there will be taxis you can hire to take you instead. An open cenote, Cenote Yaal Utsil has a 12-meter-long wooden staircase leading down to its blue, mirror-like waters. The cenote is a good size for swimming, at 25 meters by 40 meters, while it also plunges a massive 50 meters down below the surface. Here you can find the local kids climbing the walls and jumping into the water. 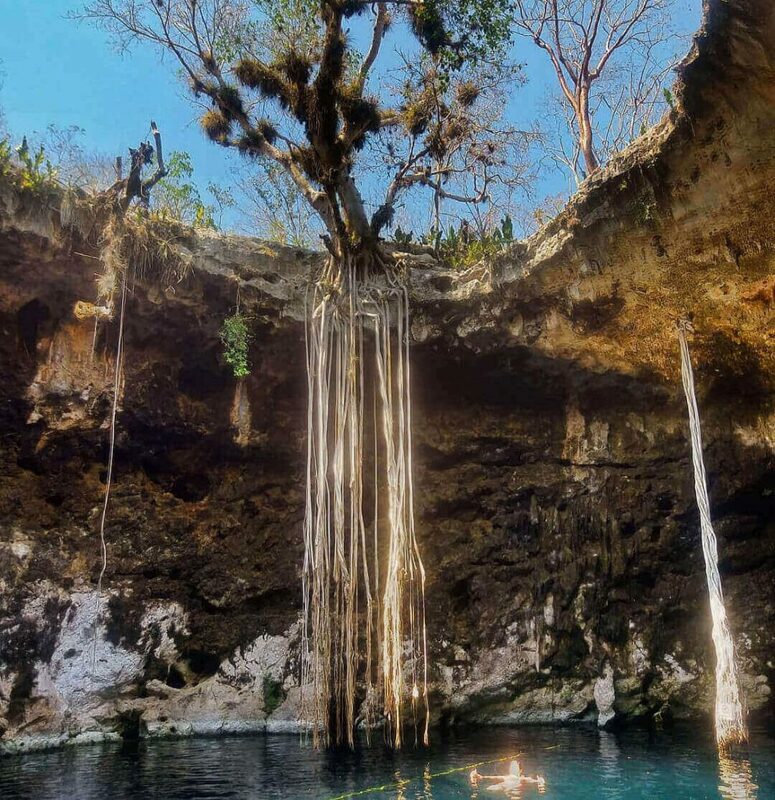 Meaning ‘yellow tree fruit’, Cenote Kankirixche is a semi-open cenote, with the water half covered with a rock shelf. A staircase leads down to a platform on the water, which varies in depth, from 2 meters to 50 meters. The waters stretch 25 meters in one direction and 15 meters in the other. Just 40 minutes from the center of Merida is Cenote San Ignacio. Known to the Maya as Tuunich Ha, or ‘water in the stone’. Entering its cave, you’ll find an elegantly lit interior, while there’s also a restaurant offering regional cuisine, changing rooms and space to relax. A great cenote for families. Situated in the tiny village of San Antonio Mulix, the beauty of Cenote Dzonbakal (or Cenote Dzonbacal) is well worth the journey. Given its location, it has surprisingly good facilities, including a restaurant and basic accommodation, all run by the community. You can visit Dzonbakal and X’Batun in the one day. Close to Cenote Dzonbakal, you’ll also find Cenote X’Batun. Turquoise waters draped with foliage from the jungle. A superbly serene spot in which to relax, the cenote is located within a shallow ravine, which is the natural habitat for a plethora of different bird species. Cenote Xlacah is located at the archaeological site of Dzibilchaltun. 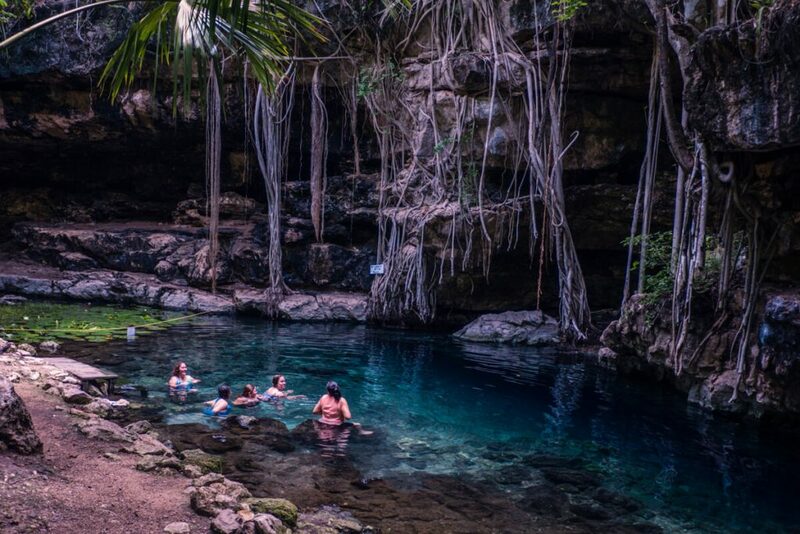 This means visitors can combine a visit to Mayan ruins with a cooling dip in one of the best Yucatan cenotes. Easily accessible, since it sits at ground level, its shallow waters boast a stunning layer of water lilies. 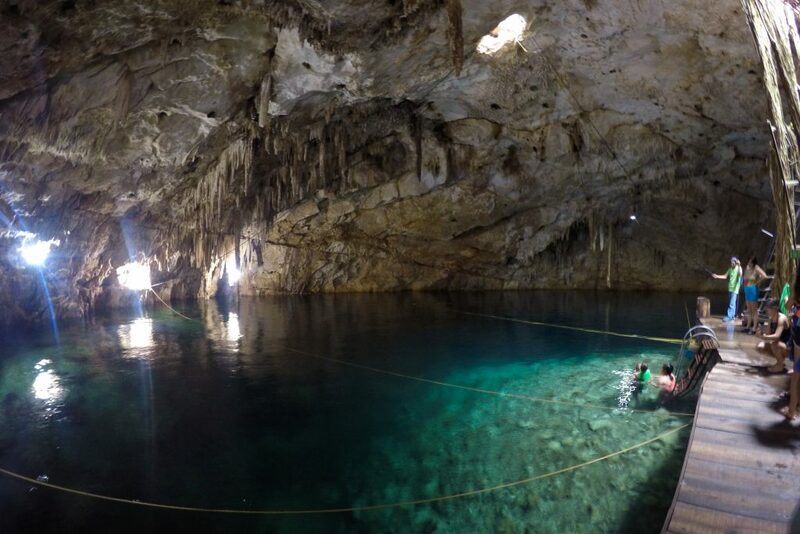 What’s more, this cenote is just 15 minutes from Merida. The slightly more recent ruins of Hacienda Mucuyche are home to a cenote of the same name. This cenote is famed for being the place Empress Charlota of Mexico swam in 1865 before crossing the Atlantic to beg Napoleon III for help. 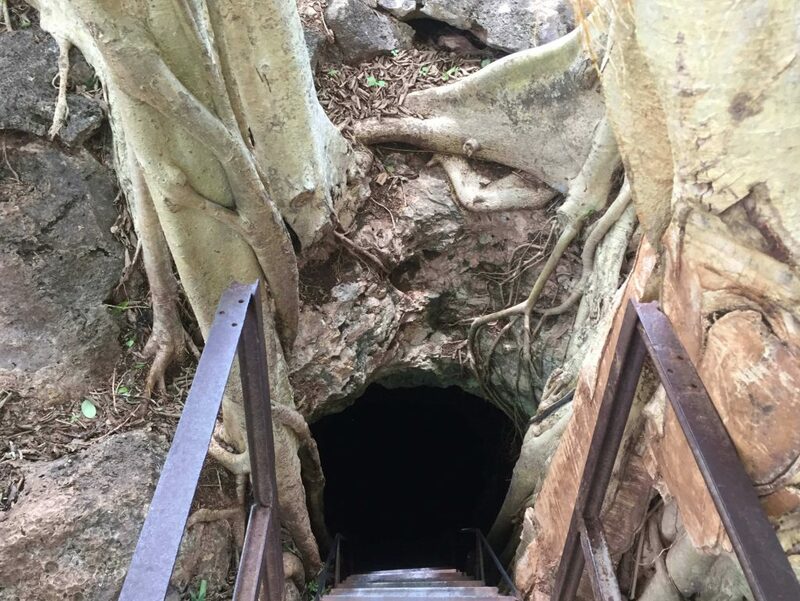 19th Century stairs lead to the cenote, which is semi-open and has an incredible array of rock formations. Cenote Nah Yah is a semi-open cenote. Nah Yah is great for swimming, jumping, and diving. 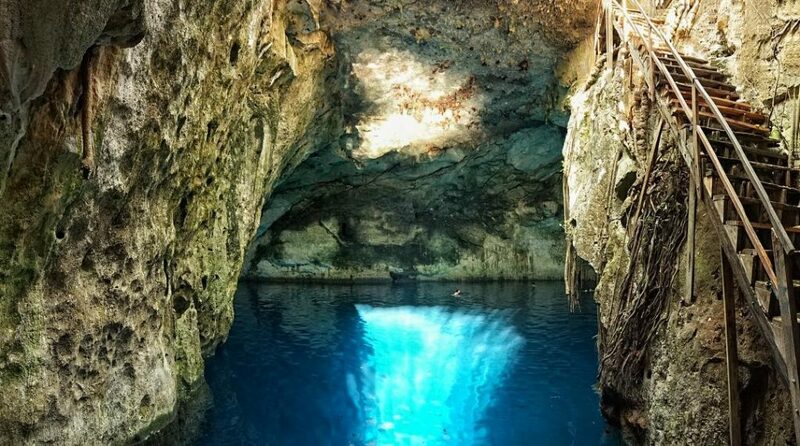 The beautiful blue, deep waters and caverns make this cenote ideal for diving. It has an 8m freefall to the water level and it’s maximum depth is 48m. There are campsites and palapas for the family to relax in the surrounding nature. Merida is served by Manuel Crescencio Rejón International Airport, which has flights from other cities in Mexico, the United States, Canada, and Europe. Long-distance buses also connect Merida to other cities in Mexico, while taxis run shorter routes. 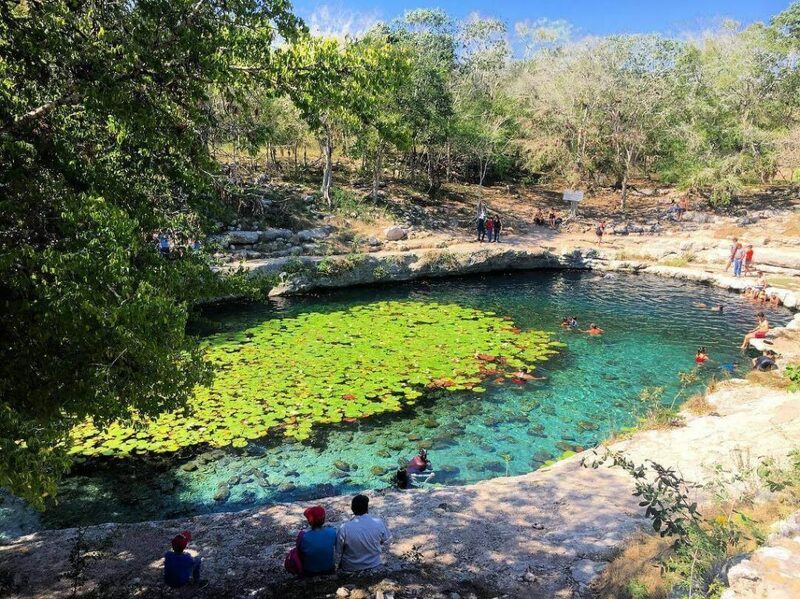 Although there are a couple of cenotes right near the center of Merida, you’ll find most of the cenotes around Merida slightly further afield, from as little as 15 minutes away by car to roughly an hour. Renting a car or hop on a cenote tour which you will be able to organise through your hotel. With so many cenotes dotting the Yucatan peninsula, it can be difficult to decide which to visit. 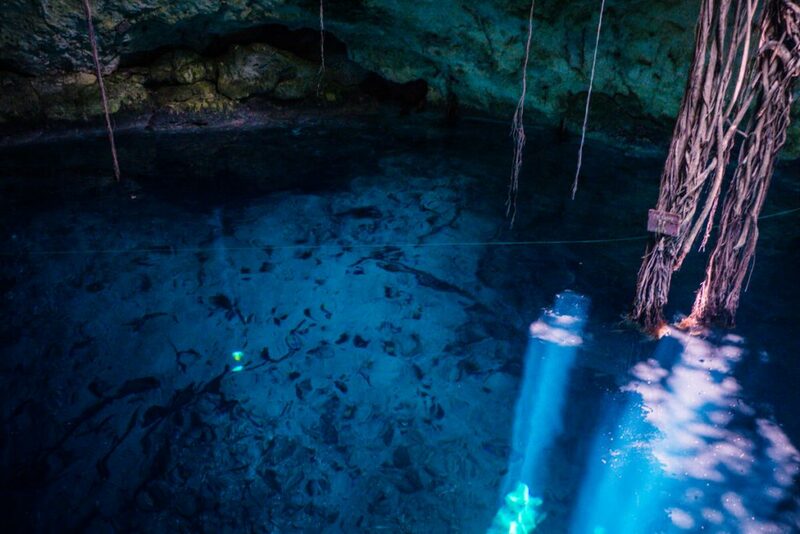 For those staying in and around Merida, we’ve highlighted the best cenotes to visit.